Day Three held one of the most enjoyable hikes I had ever hiked: Watkins Glen. Watkins Glen was truly mesmerizing. The cliffs and the creek were gorgeous, and created a sense of a whole different world. No words for it, really, it's a sight only eyes can describe. I noticed there were big shiners in addition to trout and small white suckers. I had looked up this location and I saw there were a few reports of striped shiners in Watkins Glen. These large, deep bodied shiners seemed to fit the description of a striped shiner. I only had a couple minutes of spare time to fish, so I rigged a tiny tanago hook with a nub of worm under a tiny float. It didn't take long for one of the shiners to bite the suspended worm, and I lifted it up and took some photos. 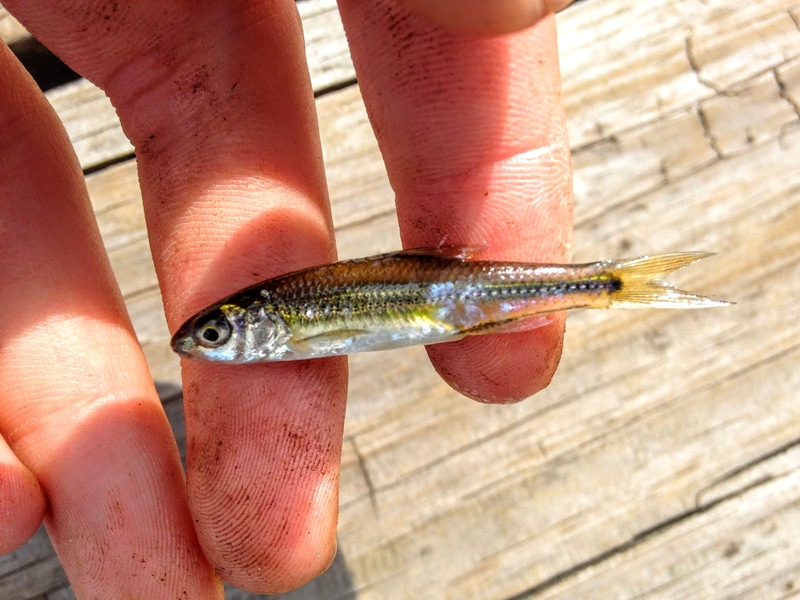 I tried my hardest to turn this into a striped shiner, but a predorsal scale count confirmed by fear: It was simply a common shiner. Still though, Watkins Glen was an amazing experience, definitely one of the most beautiful places on earth. Later, I got dropped off at the Seneca Lake Pier along with my grandpa after we looked around the lake. The water was crystal clear, and there was no shortage of an abundance of life. 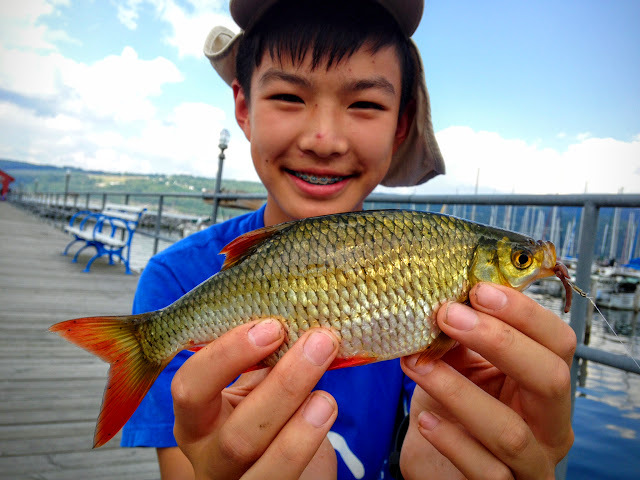 There was plenty of vegetation, shiners, tiny perch, sunfish, and even a 20+ lb carp. The real thing, however, that immediately caught my eye were the golden fish swimming among the cabbage in large schools. I immediately knew what they were: Rudd!!! Immediately all my efforts were focused on trying to catch this European exotic. I rigged up a baitholder hook with some worn and drifted it in the school of rudd. What I discovered was that the suspended bait had to be directly in front of the fish, otherwise the fish would show zero interest in my presentation. Soon, a small rudd committed and I hauled up my first rudd! That's species #54! 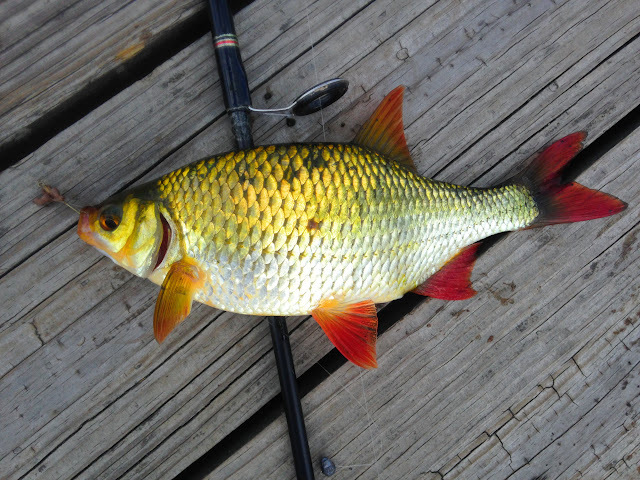 After that first fish, I thought it would be a piece of cake, catching these rudd. Boy, was I wrong. The rudd are incredibly picky, and after I caught that one, most disappeared, and I didn't catch one again. As these fish are invasive, and a delicacy in Europe, I decided to keep this one and to see how they tasted. The rudd were gone, and I diverted my attention to the giant schools of shiners on the surface of the lake. They were incredibly aggressive and I caught a bunch quickly. 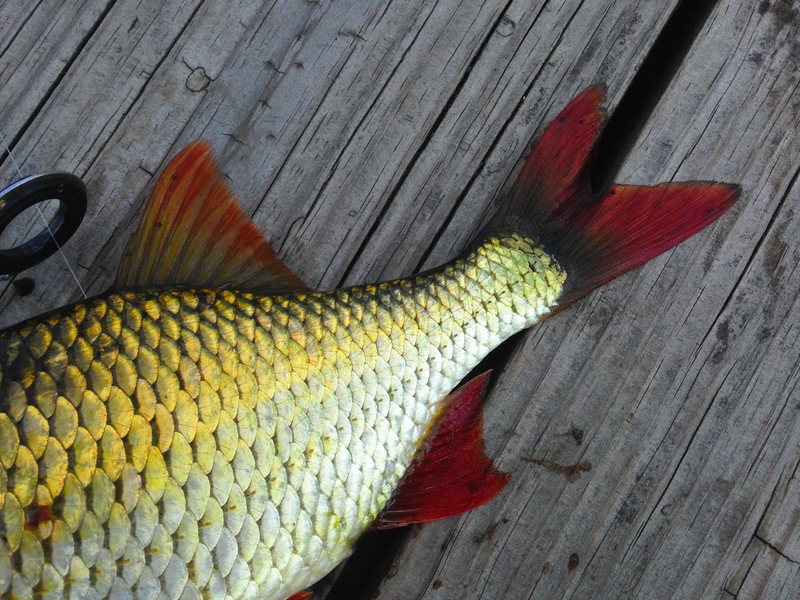 Unfortunately, they turned out to be spottail shiners, a species that I already have. 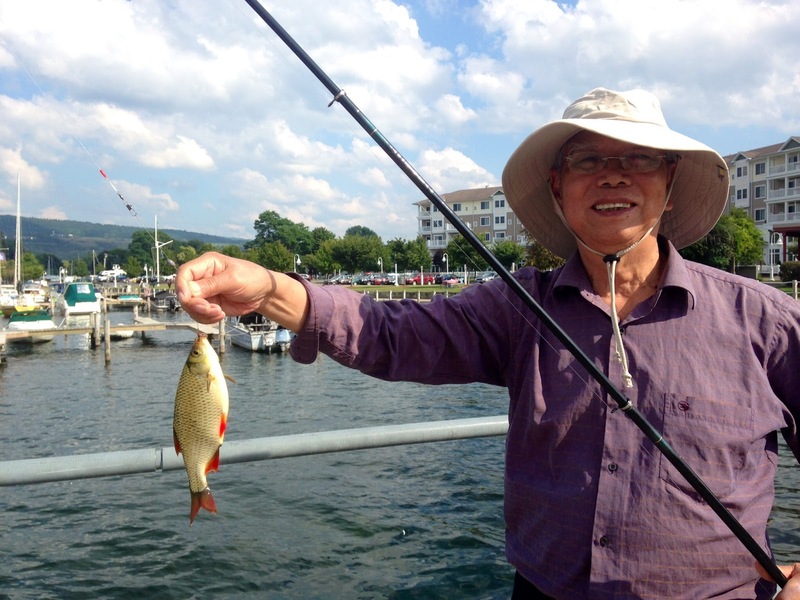 Soon, my grandpa caught a similarly-sized rudd. We kept that one, too. I began casting a swimbait in hopes of a northern pike, unsuccessfully. However, I saw an absolute beast of a 2 lb perch follow my lure to the surface. Wasting no time, a quickly caught a spottail shiner and sent it out. I saw the fish swim down slowly, then a hard hit. 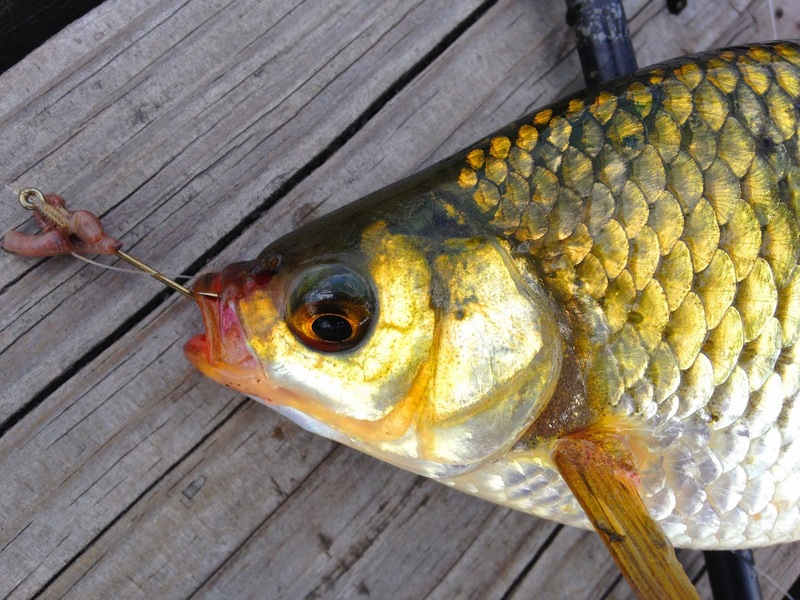 I fought the perch to the surface, saw its massive flank, and just like that it threw the hook. 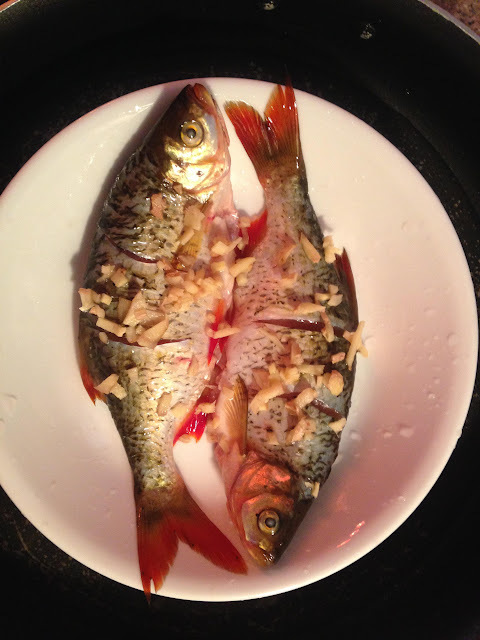 I know yellow perch are supposedly common, but I have yet to add it to my lifelist. Previously, one was caught but it flopped back into the water while trying to take a picture. Ever since, I have held a grudge, so this loss was like rubbing alcohol in a cut. 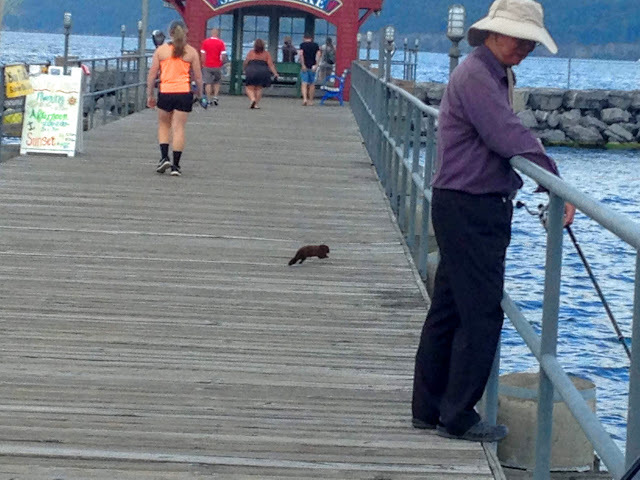 Minks bounded across the pier every so often, hoping to steal a bite of bait. After the perch tragedy, we were ready to call it a day. Back at the cottage, The rudd were steamed by my dad and we all tried a bit. It was delicious; and the meat was white and flaky, not fishy at all. The only thing was that it was very bony, but the bones were easy to avoid.